Leveraging the power of a diverse learning ecosystem, Xvoucher connects training, certification and continuing education providers on one centralized hub. At Xvoucher, our mission is to provide the opportunities for learning that empower growth in people and business. Founded in 2003, Genuine Genius Technologies began as a learning operations consulting firm providing customized solutions to back office challenges. For nearly a decade, Genuine Genius Technologies worked with clients such as HP, Juniper, CompTIA, Pearson VUE, and the U.S. Air Force earning a reputation for expertise in voucher management and distribution. While creating customized systems for training entities, certification bodies and large enterprises, it became apparent that all had complex challenges -- but with common threads. This led to expansion of our development team and the creation of our signature solution, Xvoucher. Xvoucher because we solve to X. Launched in 2012. 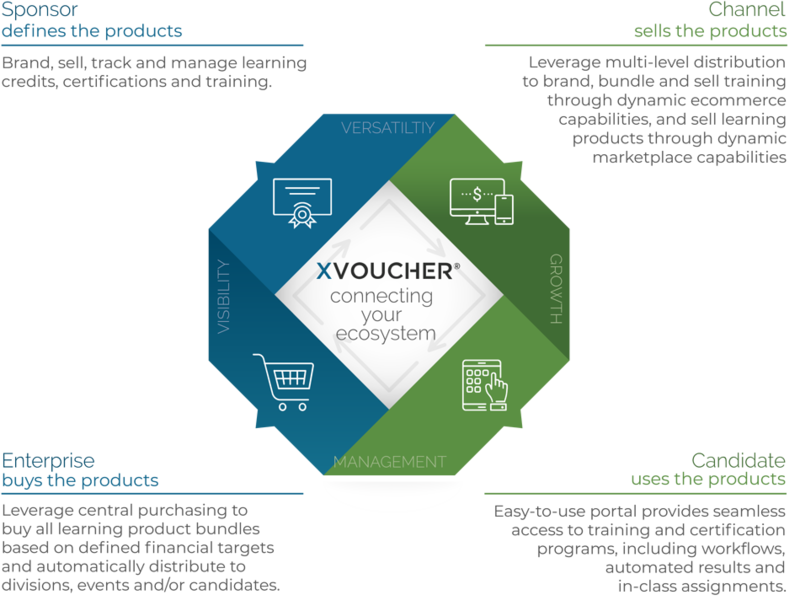 Xvoucher has evolved to become an unparalleled, robust, secure learning exchange platform in the professional development and certification space. Xvoucher is proud to serve clients around the world: this year over 500,000 candidates in 136 countries will access the Xvoucher Learning Exchange. Our work with partners and clients in the learning and certification space -- such as Global Knowledge, Pearson VUE, Kaplan, Capella, CompTIA, HP, Microsoft, Facebook, and HR Certification Institute -- enables a seamless experience for every function in the learning ecosystem. This means certification bodies, content providers, training organizations and corporations have a streamlined way to manage, sell, purchase, distribute and track certifications, training and learning credits. Xvoucher isn’t a Learning Management System -- we integrate with your LMS to extend its reach. In its simplest terms, Xvoucher allows users to go from a single point to many. Organizations come to Xvoucher, the hub for managing learning, to help their people grow and to be a part of a larger network to grow their organization. Interested in Learning More? Fill out the form below and someone will contact you shortly!